The next Swissbau is being held from 21 to 25 January 2014 in Basel. Swissbau – the only exhibition of its kind – brings together some 1200 exhibitors and more than 100 000 professional visitors from the construction and real-estate industries every two years. The opening event and the various panel discussions will feature representatives from politics and business, star architects and also senior executives from all the key industry associations, who will be actively participating in the discussions on sustainable building and renovation. This time round, however, Swissbau will stand out not only on account of its top-quality offerings but also as a result of the spectacular new complex designed by architects Herzog & de Meuron. The run of success experienced by the Swiss construction and real-estate industry has continued this year too. Each year, the industry is constructing some 45 000 new apartments, for example. Overall building activity has reached a new record level, at an estimated 58 billion Swiss francs. The industry is thus making a particularly important contribution to ensuring that the Swiss economic climate remains positive in overall terms. The number of jobs in the construction industry, and especially in the finishing trades, has risen continually over the past few years. The correspondingly glamorous kickoff for Swissbau takes the form of the traditional opening event on Tuesday morning, under the auspices of the umbrella organisation, bauenschweiz. Hans Killer, the organisation's President, will be presenting new facts on the momentum of the Swiss construction industry and showing just how much the entire Swiss economy is benefiting from this. His eminent guests will be focusing on the question of "New replacement buildings: are there alternatives?" The audience can thus look forward to exciting theses and incisive opinions once again. Wherever a great deal is invested, constructed and converted, responsible thinking and action is called for. In more than 50 events and arena discussions, leading experts will be addressing the topical issues of the industry. This time round, Swissbau Focus is covering the four key topics of training for the construction industry, building lifecycles, the Energy Strategy 2050 and densification. The leading partners here are the Swiss Society of Engineers and Architects (SIA) and the Swiss Federal Office of Energy with the "Energie Schweiz" label. At Swissbau Focus, the specialist audience will be able to find out, among other things, why buildings in Switzerland have a key role to play in the energy U-turn. Under the lead of the Federation of Swiss Architects (BSA), eminent representatives from the field of architecture will be speaking at the Future Forum. They will be discussing the question of what the professional profile of an architect essentially involves today, and how this will change in future. The traditional Saturday event organised by the "Architektur Dialoge Basel" Foundation also promises a high-calibre discourse. This includes, on the one hand, an exhibition on the innovative Arch_Tech_Lab at the ETH Zurich and an internationally comprised panel who will be airing different positions on doctrine and different approaches to building. The top speakers are Richard Horden, Bijoy Jain and Bjarke Ingels. A big building exhibition would be lacking something if it didn't provide a platform for life in the home too – a dazzling presentation of our domestic setting. Once a building is finished, its owners and users want to enjoy it to the full. What will feature in the home of the future? Swissbau documents the differences between the "old" and the "new order" in bathrooms and kitchens. The organisers are reckoning with more than 100 000 professional visitors, primarily qualified experts from the fields of planning, investment, the building trade, real estate management, education and research. This makes Swissbau the leading exhibition and, every two years, the most important meeting point for the industry in Switzerland and one of the leading platforms in Europe. Swissbau essentially displays the very latest offerings from the construction and planning sector: new materials, products, systems and technical innovations. One particular highlight is the Kitchen and Bathroom Trends where, in spectacular presentations, leading suppliers present creative designs and materials to dream of. In short, the exhibitors know how to showcase all the different trends from planning via the building shell right through to technical systems for buildings and interior fittings. Swissbau 2014 brings together what belongs together. And that also applies to the exhibition building itself. 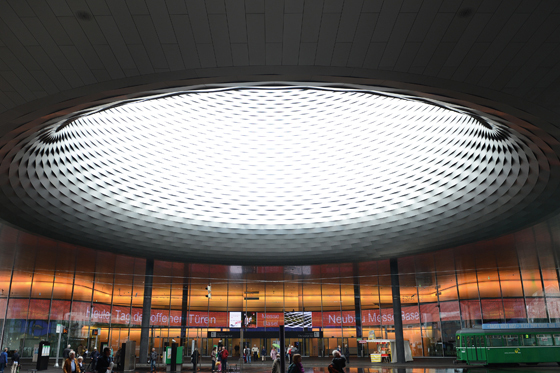 For the first time, this big show for Switzerland's construction and architecture scene is being staged in the new hall complex at Messe Basel. The complex was designed by Swiss star architects Herzog & de Meuron. The spectacular building is not only a delight to behold but also has many advantages for all those involved: the entire exhibition area of some 140 000 square metres is now located under the same roof. Visitors no longer have to cross the road to reach a number of the halls. "The replacement new building also opens up a whole new potential for presenting a company, since an exhibition stand frequently displays an outstanding quality of design", stresses exhibition manager Rudolf Pfander. Ceiling heights of up to seven or eight metres are available for exhibitors in some areas, making it possible to achieve spectacular stands. And precisely for professional visitors interested in architecture and construction, this promises the ultimate in showcasing and the best possible exhibition experience. Multimedia coverage will be provided of all the events being staged at Swissbau, with the new media making them accessible to a bigger public. Video clips are to be posted on swissbau.ch – ensuring that the latest knowledge is then available to be deployed on a sustainable basis. Since 2011 already, eminent names from business, science, politics and society have been posting weekly contributions on the www.swissbau.ch/blog relating to topical issues for the sector, including training for the construction industry, building lifecycles, the "Energy Strategy 2050" and densification. Those interested are invited to participate in the debate: topical, controversial and all-embracing.